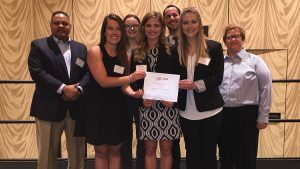 For the fifth year in a row, Missouri State University’s Ad Team proved unbeatable in a national advertising competition sponsored by EdVenture Partners. The team of 17 students, led by Dr. Melissa Burnett, professor of marketing, competed against 15 other teams in the American Fuel and Petrochemical Manufactures (AFPM) Recruitment Challenge, Spring 2017. They got to the final round May 18 in Houston, Texas, and finished first. Several Ad Team members with Terrence Martin, Phillips 66 head of labor relations (far left), and Dr. Melissa Burnett (far right). The challenge required teams to create a recruitment campaign for AFPM to increase awareness and interest of skilled craft career opportunities in the fuel and petrochemical industries. Through in-depth research, the Ad Team created The Energy Crew brand to target middle school students instead of older youth as outlined by the client. The Energy Crew is a multi-tiered, education-based campaign focused on how people can make a difference in powering the planet. To share this message, the team designed lesson plans for teachers and created TheEnergyCrew.com, a digital platform to educate, empower and connect students, teachers and those who want to help power the planet. This article was written by University Communications. The original article can be found here.